Eleven Honor Flights descended upon the WWII Memorial and it was nice to see the fountains blasting away and the Memorial Plaza filled with veterans, guardians, tourists and everyone was shaking hands and posing for pictures. I missed the early flights (San Diego must be on California time!) but made pictures the rest of the day. I just was walking by Florida as they began to assemble fpr a group picture and helped with what I call “herding cats.” I happened to get this very Norman Rockwell picture which is appropriate as I feel “like Apple Pie” when I am around Honor Flights. 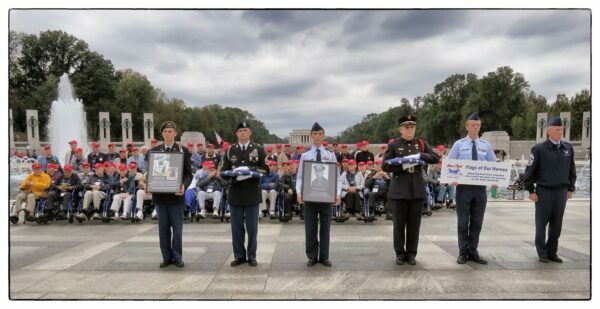 Despite our recent national political BS, Honor Flight‘s leadership kept a clear head. and Jim McLaughlin and Diane Gresse deserve the highest accolades. It’s “rumored” that Jim McLaughlin and Jeff Miller were on the phone with the National Park Service’s Bob Vogel the night before to make the Memorial available. Neutrality and bi-partisanship (Senator Dole’s favorite subject!) prevailed. Speaking of which , the master of bi-partisanship Senator Dole was there yesterday and is predicting he will be on his feet in two months. I am looking forward to strolling across the Plaza with him again. These last couple of weekends have provided me with new material for the next edition of the book so I am lucky to have a subject that is ever-changing and developing. The images for the day can be viewed at the the Image Library and downloaded for “personal use only.” If you would like to use the images in any other context, please send me an email. “Jewel of the Mall” is available in both epub and printed versions and you can download a FREE sample. October 20, 2013 | Filed under About the Book, Blogs, Honor Flight, Photography, WWII Memorial and tagged with Arlington Cemetery, Current Affairs, DC PHOTO BOOK, Honor Flight, Jewel of the Mall, National Park, patriotism, photography, Senator Robert Dole, World War II Memorial.